Located towards the corner of the Yerebatan Cistern which supply the water of the Ottoman Empire and stand oppisite to the Blue Mosque ( Sultanahmet Mosque ) and St. Sophie Museum. 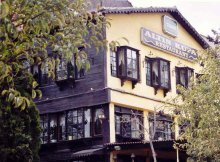 Altin Kupa Restaurant offers you an appreciated halt in the center of Sultanahmet . This domestic residence aged of 200 years was owned by Mr. Ahmet Ihsan Koc who is the older grandfather of the actual owner whom have transformed the house to a restaurant. The Koc Brothers manage this warmhearted restaurant with skilfulness 25 years combining the ottoman traditional cuisine and modern European cuisine with simplicity. In the summer face to the light tricks of the Blue Mosque at the terrace or in the winter face to face to beholder Sultanahmet decked out to white color. Altin Kupa can't be expressed by words but can be lived. Don't we say that a Turkish Coffee has a souvenir of 40 years so come , take a coffee and fix one new friendship. To add one touch of pleasure during your stay in the old village. Altin Kupa with it's staff whom speaking English would be delighted to greet you. An afflucent and variable menu frequently set up by day.A homely welcome due to the fact that each guest already participate in the family.